complete and precise to the millimeter. is owned by Dr. Ewald (Ed) Metzler, M.C.L.. This website is designed to be viewed at screen resolutions of 640 x 480 or 800 x 600 pixels. 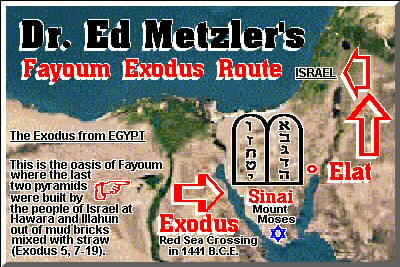 Illustration concerning Dr. Ed Metzler's Fayoum Exodus Route. Email: Dr. Ewald (Ed) Metzler-Moziani. by Dr. Ewald (Ed) Metzler, M.C.L.